Finally!!!! Thank God no more Erdem!! Wow! Matte Marit really brought her A game tonight! Fabulous! Catherine also looks good. It happens rarely but tonight I have to admit that the duchess looks stunning! I love the dress and the cape. OMG, The Duchess of Cambridge look absolutely amazing tonight. Every inch a future Queen! Edit: HM the King will speak shortly. Edit: Kate is sitting between the King and the President of the Storting (parliament). Edit: William is sitting between the Queen and the Prime Minister. Edit: The King is looking a bit frail this evening. Edit: William started his speech in Norwegian. Edit William concluded his speech by saying "tusen takk" (many thanks). She sure does. Just glowing! Whoa, I am not liking this look at all. Looks like Elizabeth Taylor circa 1975. It's gorgeous ..Just saw a pic of how it looks when she's walking. I like retro when it's done right. Catherine just floated to the banquet in her dress. Beautiful! I must say I find this visit much more interesting than that to Sweden...! I didn't realize they were 'quite close' with the Norwegians. 'quite close' with the Norwegians. Far, far closer in terms of common ancestry, I had thought that only 'mattered' to the older generation but on today's showing i'm not so sure..
All of them seem very at ease with one another. It is a pleasure to see. Makes you wonder what those Royals are getting up to behind the scenes! I like it though, it's good to see the various houses interacting with each other. I don’t know about William and Kate, but the Queen Mum, The Queen, Charles and Anne are all very chummy with the Norwegians. Princess Anne is Haakon’s godmother, for example. 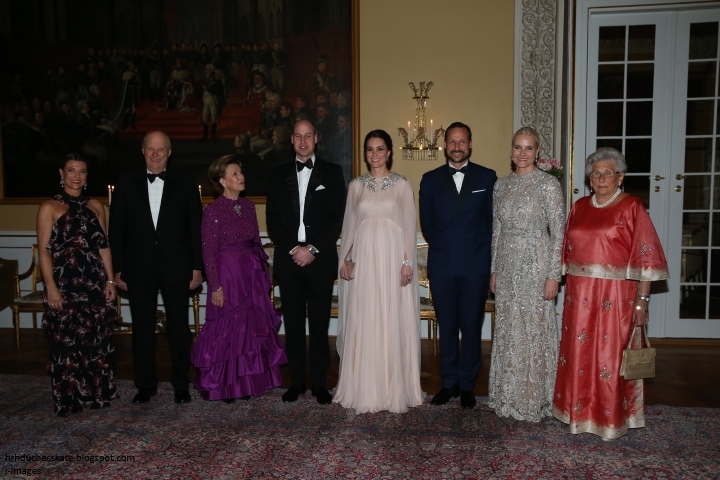 And Haakon and Mette-Marit were one of few royal guests at Charles and Camilla’s wedding. I also believe that the Wessexes and the Gloucesters are close to them. Sweden was more informal. The Norwegians really rolled out the red carpet for W&K. That is understandable: compared to Sweden, Norway is a less "powerful" country (in geopolitical terms) and a visit from British royals is a bigger deal. According to KP, W&K had never met MM and Haakon before. They had met Victoria and Daniel at the royal wedding in London, but didn't know them well. King Harald and Queen Sonja are considered "close" to Queen Elizabeth II. I don't think they had any relationship with W&K. In terms of degree of kinship, Harald is Elizabeth's second cousin, while Carl Gustaf is a third cousin (not that much difference then). Carl Gustaf's predecessor in the throne of Sweden (king Gustaf VI Adolf) had two British wives, so he was a quite overt anglophile. His first wife was a granddaughter of Queen Victoria and his second wife was Prince Philip's aunt, I think. According to KP, W&K had never met MM and Haakon before.